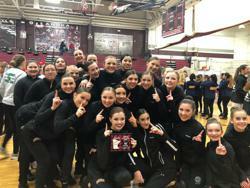 On January 12, 2019, the CDH Dance Team competed at the Anoka Dance Invitational. The team placed first in AA Varsity Jazz, fourth in Varsity Kick, and fourth in JV Jazz! The team is excited for a strong start to 2019 and eager to compete at conference finals on Wednesday, January 23, at Woodbury Senior High.